Koishikawa Korakuen (小石川後楽園) is a Japanese Garden located in Tokyo. 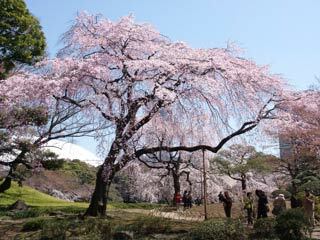 It is one of popular Sakura Spots. There are 7 beautiful Shidare-Zakura (Weeping Cherry Blossoms) which represent the great harmony and peace with Japanese gardens. Also, there are many other Sakura which tell the arrival of the Spring. Beautiful Sakura and Japanese garden are always match up perfectly. The Koishikawa Korakuen was first laid out in 1629 by Tokugawa Yorifusa, but its construction was completed by his successor Mitsukuni, an enlightened lord of the Tokugawa family of Mito, with the assistance of Zhu Shun Shui, a refugee scholar from the Ming Dynasty of China, who came under the lord's protection. It was designated by the Cultural Property Protection Committee as an important special place of scenic and historic interest, and was turned over to the Tokyo Metropolitan Government for management in 1936. Korakuen is the oldest of all the gardens in Tokyo and it is a typical stroll-graden built in early days of the Tokugawa Era. In the central part of Korakuen, there is a placid lakelet with winding walks running around, stone lanterns, trees and arched bridges arranged skillfully in harmony with their surroundings. Miniature views imitating noted Japanese and Chinese scenic spots such as Xihu and Lushan in China are presented, which please the eyes of the visitors. You can also enjoy beautiful colors offered by seasons. In Winter, you can enjoy Ume (Japanese plum) blossoms. In Spring, Sakura blooms. In summer, you can enjoy Water Lily and Lotus. In fall, you can enjoy great autumn colors. Feel Edo Period at Koishikawa Korakuen. It is special place of scenic beauty and special place of historic monument like Kinkakuji in Kyoto, or Hamarikyu Garden in Tokyo. Koishikawa Korakuen is right next to Tokyo Dome which is the one of the most famous amusement park in Tokyo. Many exciting and famous events are always hold at Tokyo Dome. It is the modern entertainment spot in Tokyo. On the other side, Koishikawa Korakuen is still keep the classic style of Japanese Entertainment in recent Tokyo. It is the gardening. It was built in 1629 by Mitsukuni Mito who is also known as Mito Komon. You can see and feel the Edo air in this garden, and touch the history.